DRIVING DIRECTIONS to Daffodils & Homesites from I-85 North, Exit 170: at the bottom of the ramp, merge onto Hwy. 70. Immediately move into the left lane and make a U-turn using the median cut-through. You are now heading west on Hwy. 70. Move into the right lane. Turn right at the first light onto Pleasant Green Road. You will pass the Pleasant Green Access and cross over the river. In 2 miles, turn left onto Cole Mill Road. You will reach the Few’s Ford Access of Eno River State Park in less than 1 mile. The physical address is 6101 Cole Mill Road, Durham NC 27705. Take the second right after passing through the park gates. Park here at the Piper-Cox House parking lot. 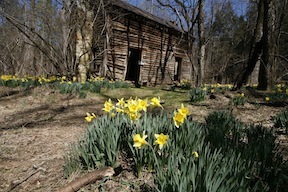 DRIVING DIRECTIONS to Daffodils & Homesites from I-85, Exit 173: head north on Cole Mill Rd. away from Hillsborough Rd. Stay straight on Cole Mill Rd. for approximately 4 miles. You will cross the river and come to a stop sign at the Pleasant Green Road intersection. Continue straight and in less than 1 mile you will reach the Few’s Ford Access of Eno River State Park. The physical address is 6101 Cole Mill Road, Durham NC 27705. Take the second right after passing through the park gates. Park here at the Piper-Cox House parking lot. *For driving and hiking directions to the HOMESITE NEAR DUNNAGAN’s GRAVE, please refer to last year’s calendar: http://www.enoriver.org/events-and-activities/what-we-protecthidden-gems-of-the-eno/february-dunnagans-grave/. The homesite is just off- trail, downhill of the grave. Anthony Cole’s house: Take the Buckquarter Creek Trail (blazed with red dots) from the Piper-Cox House parking lot. You will quickly reach the river at Few’s Ford. Take the small footbridge to your right then make a right onto the upper, ridge side of the Buckquarter Creek Trail. Stay on this trail until you reach the intersection with the Ridge Trail (blazed with blue horseshoes). Walk across the footbridge on the left side of the trail; continue walking straight into the woods along this remnant of the “driveway” heading to the house. In 100 feet, the woods will open up and the Anthony Cole house will come into view. Please do not enter the house as it is dilapidated and unsafe. This round-trip hike is approximately 1.5 miles. Historic information about this site is fairly well documented. If you have an interest in knowing more about Anthony Cole and other inhabitants of this house, please visit the state park headquarters. Morgan Hill homesite: To see this large scattering of daffodils and stone piles, follow the directions for the month of June to Christian Shy’s Ford. This round-trip hike is approximately 2.5 miles. J.T. Faucette homesite: If you want to visit this homesite, which has a standing chimney and visible stone foundation and is located near what was once an important crossroads, then follow the directions for the month of August – Hidden Road to Cabe’s Ford. This round-trip hike is approximately 2-2.5 miles. Cox Mountain homesite: We know nothing about this homesite, but there is a visible roadbed and a beautiful grouping of daffodils to see. To reach this site, cross the suspension bridge and continue on the Cox Mt. Trail for approximately ½ mile. The trail will begin a slow downhill to a small stream crossing. Hop across the creek and turn left, following the stream into the woods. In approximately 100 feet, the stream will bend to the left. Bear to the right and look for an old, narrow roadbed with rocks on both sides. It looks like nothing more than a wash. Head up the wash. Fifty feet after the roadbed begins to lose form, look uphill to the right for signs of the homesite. This round-trip hike from Piper-Cox House parking lot is approximately 2 miles. Sister’s house: To find this still standing one-room house, take the Ridge Trail away from the Buckquarter Creek Trail. In less than ¼ mile, you will see the house a 150 feet off the right side of the trail. This is supposedly the house Anthony Cole built for his sister who was a spinster (a woman who never married). This round-trip hike is approximately 2 miles. Wardwell School: This is possibly the site of what was once an African-American school for local children. To find the stone pile and daffodils associated with this site, follow the directions for the month of August – Hidden Road to Cabe’s Ford. Once you reach the river on the cable right-of-way and turn right, look to your right for an old road bed that heads uphill at an angle. Follow this roadbed to the school. 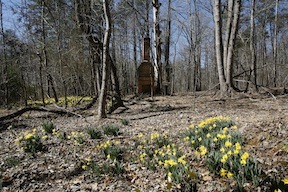 Unless you have a GPS unit, you will not be able to find this site without the assistance of blooming daffodils. This round-trip hike is approximately 2.5-3 miles. John Scarlett, who was born in 1920, attended the Wardwell School. You can read an interview with Mr. Scarlett conducted by Joe Liles at: http://www.enoriver.org/fishdam/johnscarlett.htm. Each of these sites has a unique story to tell about the people and times during which they were used. Unfortunately, historic records are not extensive for these sites, but they all have one thing in common—each boasts a beautiful early springtime bloom of daffodils. We hope you will get out and enjoy these fields of yellow for years to come. The flowers at these sites usually bloom in late March to early April.